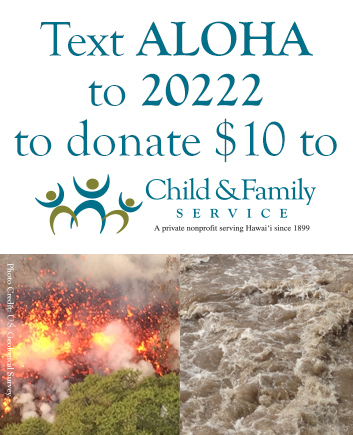 HELP THE FAMILIES & INDIVIDUALS AFFECTED BY THE FLOODS ON KAUA'I AND ERUPTIONS ON HAWAI'I ISLAND. A one-time donation of $10.00 will be added to your mobile phone bill or deducted from your prepaid balance. Donor must be age 18+ and all donations must be authorized by the account holder (e.g. parents). By texting YES, the user agrees to the terms and conditions. All charges are billed by and payable to your mobile service provider. Service is available on most carriers. Donations are collected for the benefit of the Child and Family Service by the Mobile Giving Foundation and subject to the terms found at www.hmgf.org/t. Message & Data Rates May Apply. You can unsubscribe at any time by texting STOP to short code 20222 text HELP to 20222 for help.